The Channel Islands pictured are, from left, Guernsey, Herm, Sark and Jersey. 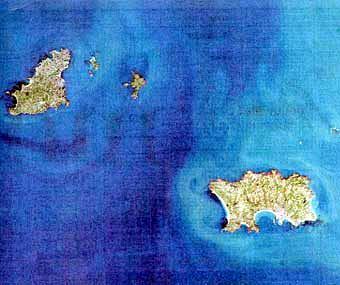 This overhead photograph of the Channel Islands picks out clearly the beautiful coastline shapes created by the erosion of the land by the sea over time. On the Ptolemy map below we see the crude attempts to survey the Mediterranean coastlines, yet on the much earlier Portalano (port to port), the Piri Re'is, and the Oronteus Finaeus maps we find exceptional detail. Looking at the many practical problems of making accurate coastline surveys, this would suggest that these earlier maps could only have been created from airial surveys and high technology equipment. On the Oronteus Finaeus map of the Antarctic, where both coastline detail and the overlying ice cover are accurately recorded, this would explain how the maps were created in relatively modern holocene times. In isolation, Professor Hapgood's thesis within Maps of The Ancient Sea Kings is a difficult one to accept. However when taken with Professor Stechini's observations of ancient land surveys, and the raft of supporting evidence of an advanced world wide civilisation, his case is made.